The discussion of megacities has drifted into a combination of oh-my-god and pie-in-the-sky narratives displacing potentially sensible and useful analyses. As an example of the first, consider how often one hears that Karachi had a population of 11 million in 1998 and is twice that now – as if that was enough to clinch the argument that we have a mega-problem on our hands. My response is: So what? I am not particularly bothered if the population rises to 30 million. What matters, and this is the real question we should be asking, is whether Karachi is well managed and whether its management is improving or deteriorating over time. Suppose the answer is that Karachi is not well managed. If so, does that have anything to do with its size? As a test, I would ask the proponents of the size-is-the-problem argument to go live in Mirpur Mathelo and confirm if the latter is much better managed because of its much smaller size. Simple observation should convince people that size is irrelevant to the argument – there are examples around the world of well-managed large cities and poorly-managed small ones. In that sense, Karachi having over 20 million people is nothing more than a statistic. Another oh-my-god narrative pertains to the dominance of mafias in Karachi. Once again, there is no correlation with size. Trudge around a few villages to see how land and water are controlled in small places. The brutal truth is that scarce resources everywhere in Pakistan are controlled by mafias. Some go as far as to say that the entire country is run by mafias of various sorts and if that is the case why would Karachi be an exception? Now consider the pie-in-the-sky narrative – the mantra that cities are the engines of growth, the bigger the city, the bigger the engine because of bigger labor markets, etc. Once again, a little questioning would dent this argument. 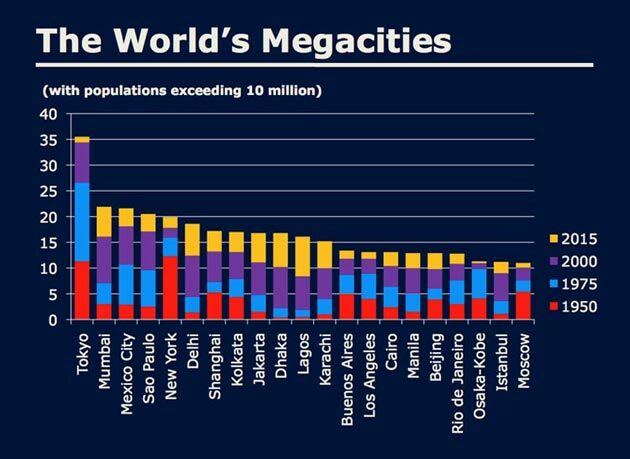 Suppose, we could double the population of Karachi overnight, would the city become much more productive? Most likely not. The more sensible question is the following: What it is that makes some cities more productive than others? As an example consider Mumbai and Karachi – they have about the same number of residents but the output per person is roughly three times higher in the former. Why might that be so? Mumbai is not immune to mafias or political groups adept in the use of violence. Nor is it claimed that Mumbai is managed all that much better than Karachi. The one stark difference is that Mumbai’s labor market is actually much bigger than Karachi’s, a result of the fact that its suburban railway – reputedly the busiest transit system in the world – transports over 7 million commuters per day while Karachi lacks any public transit worth the name. Raw numbers tell us very little. In this case, the critical analytical question relates to understanding the labor market. Intuitively, if a worker cannot afford to reach a job within a travel-time of one hour, the job is located in a separate labor market. It is quite obvious that Karachi’s labor market is fragmented because of constrained mobility. In actuality, Karachi is made up of five or six labor markets adjacent to each other – it has all the disadvantages of a large population and very few of the advantages of an integrated labor market. Given the impact of labor market size on economic productivity, it would make sense to consider ways in which to overcome fragmentation. The most obvious connector is increased worker mobility. An example from China should drive home the point: In 1990, the number of people who could reach Shanghai port within an hour was 4 million; by 2007, it was 12 million, a result of conscious and well-planned efforts to increase mobility within dense parts of the city. Such an increase in mobility does not come about simply by making traffic flow more smoothly for people who own automobiles in cities like Karachi where the majority does not own private vehicles. The imperative is to increase the mobility of workers without motorized transport living in dense and congested parts of the city. For that, investments need to be directed towards rapid public transit, a focus on facilitating bicycling and walking, and better traffic management in general. In this perspective, investments in under-passes and fly-overs are not necessarily growth-enhancing; they are convenience-enhancing for automobile owners who move further out into less-dense residential areas and commute to work into more-dense employment zones using a means of transport that is grossly inefficient. The private car transports one or two persons per trip, uses the largest road-space per capita, and consumes valuable city-center land for parking. Much is required to improve city management and economic productivity but a transition to a sensible discussion requires moving beyond simplistic narratives fixated on size. Anjum Altaf is the provost at Habib University and was formerly dean of the School of Humanities and Social Sciences at LUMS. This op-ed appeared in Dawn on March 1, 2015 and is reproduced here with the author’s permission. There are incidents in the lives of big cities that call for sorrow, but once the dust clears, no lamentation and no expression of sorrow can really do a city justice. A place that is home to millions deserves better. I aim to explore the meaning of Mumbai and then return to the salience of this latest incidence of violence in the frame of that larger context. The challenge of global warming has brought us face to face with a stark reality. Economic growth is exploitative of nature and unless we make some fundamental changes we could be headed for an environmental catastrophe from which there might be no recovery. Thinking about this issue has revived a concern that is even more problematic: Is economic growth exploitative only of nature or is it exploitative in general? In this post we will examine the historical record to seek some answers to this question.